Public Outreach and Environmental Education are important components of many governmental organizations. To protect and serve are laudible goals which are enhanced through their appropriately educating the human inhabitants. With regard to the movement of deer (or other wildlife) onto property "owned by people" anecdotes are sometimes used as arguments. This is dangerous especially when people's stories are written up in newspapers, and elected officials on governing boards have their words forever available on YouTube or other video sites. Simply saying the population of deer is definitely out of control does not make it true. Leaders saying on tape that they personally see more deer now than they did six decades ago is injudicious. According to an article at the Bellingham Herald, "...the deer population is increasing in Bellingham and other urban areas" but the journalist then goes on to say "...the city doesn’t track deer numbers." Anyway, deer are often on the move. They search for food and safe places traveling mostly at night. They don't recognize city, county, state, or international boundaries. The good news though is that hard data, statistics and other information exists that has been compiled by governmental agencies and other organizations. I would prefer to see newspapers and elected officials stick to just the facts. When they use subjective phrasing they are likely inciting misguided wrong-doing among some members of the public. Deer Culls used to manage suburban deer create a public safety issue and provide only a short term solution, requiring a perpetual killing program. Examples of the Perpetual, Annual Deer Cull. Although degraded habitat is a major cause for the decline of the U.S. deer population, suburbs often provide excellent deer habitat. Deer are edge dwellers, living at the interface of the meadow and the thick forest. A lush suburban habitat can support more deer, the carrying capacity, than a forest. Communities wanting fewer deer can reduce the carrying capacity (see figure above) using fences, deer resistant landscaping and repellents. Careful use of dogs or other deterrents can replicate the effect of a predator in a natural environment, keeping deer on the move and restricting their access to food. Examples of non-lethal approaches, news below for contraception, sterilization, and relocation. A ban on feeding deer is often a first approach, sometimes a required approach. Also a deer population survey. The population growth of humans in Washington is tracked by the Office of Financial Management. You can see an examples of their work in this WA trends page and in the map below that shows the human population change from 2000 to 2010. 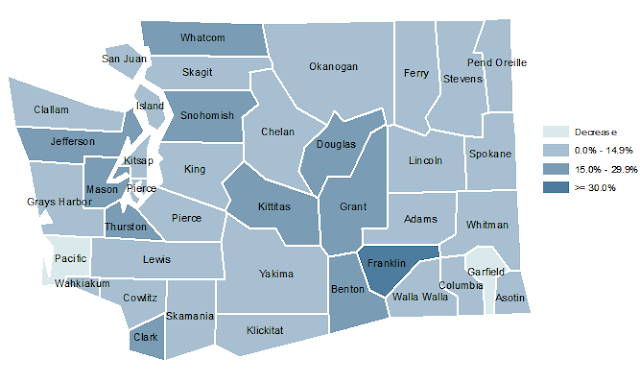 Whatcom County which is where I reside has had an increase in human population of >=30% for those years. The state is as big as New England and it seems only two counties had a decrease in population - Pacific and Garfield. Another source for facts is The Federal Highway Administration which, among other things, keeps track of how many vehicles are owned in the USA. Then the Bureau of Transportation Studies reports "Nationwide, about 88 percent of persons 15 or older are reported as drivers (table A-1). Interestingly, while the mean number of vehicles in households is 1.9 personal vehicles, households in the United States on average have 1.8 drivers who are 15 years or older (table A-2). Thus, it appears that households on average have more vehicles than drivers." There are statistics available regarding the nation's and the world's per capita ownership of vehicles. The onus for deer and motorists colliding is on people. Did you hear about the folks who called the Department of Transportation to request removal of the "Deer Crossing" sign on their road? They said that too many deer were being hit by cars and they no longer wanted them to cross there. For the moment, deer are found nationwide. Often the departments of fish and wildlife and parallel agencies have a vested interest in catering to hunters even though they are supposed to govern on behalf of all people, but that is a separate subject. Non-hunters can achieve peaceable living with wildlife by following their own common sense and guidelines that have been researched and published by reputable experts.